Myron Floren was a featured performer on the Lawrence Welk Show and considered to be the finest accordionist of his era. Floren was born in Roslyn, South Dakota, the eldest of seven children. When Myron was seven years old, he talked his father into ordering a ten dollar accordion from Sears and Roebuck, and as a result of that investment, would later become one of the top virtuosos in the world. He credits the development of his strong finger and forearm strength to milking the cows on the farm. Myron attended Augustana College in Sioux Falls, where he moonlighted teaching accordion for the Williams Music Company. One of his students was Berdyne Koerner, his future wife. When World War II began, Myron tried to enlist in the Air Force but was turned down for medical reasons relating to an episode of rheumatic fever he had as a child. So, he enlisted in the USO and entertained the troops overseas. Upon his return from the war, he and Berdyne lived in Sioux Falls where Myron had a radio show. In 1946, they moved to St. Louis where he joined the "Buckeye Four", a popular music group specializing in hillbilly music. One night, they went dancing at the Casa Loma ballroom where Welk was appearing. Lawrence invited Myron up on stage to play a number. Myron chose "Lady of Spain". The crowd and Lawrence loved it and he was offered a job with Welk that night. 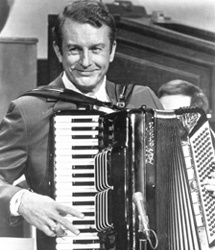 Welk's manager, Sam Lutz, recommended against hiring him because he thought that Welk would be upstaged by Myron's superior accordion playing. When Sam told Welk this, Welk responded "Sam, that's the only kind of people I hire, the one's that play better than I do!" In 1950, he joined the band and stayed until the show's end in 1982. Nicknamed the "Happy Norwegian", Myron continued performing until his death in 2005. He is survived by his wife, Berdyne, and five daughters, including Kristie, who is married to dancer Bobby Burgess.